Heat oil in a kadhai or pan and temper mustard seeds. Add cumin seeds and chopped onions. Fry for 2 mins. Add grated vegetables, turmeric powder, red chili powder and salt to taste. Cook for 2-5 mins and keep aside. Combine wheat flour and salt in a mixing bowl. Knead to a smooth dough adding water and little oil. Keep aside for 30 mins. Make small balls of the dough. Take a ball and flatten it in the shape of a disc. 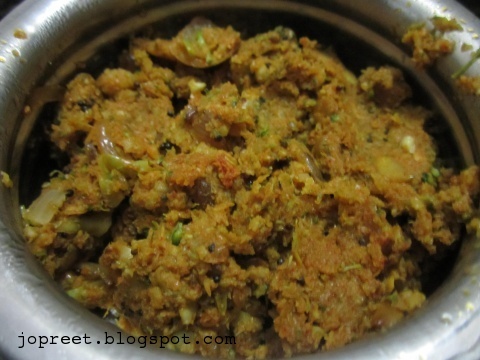 Fill it with spoonful of masala and close all the sides of disc. 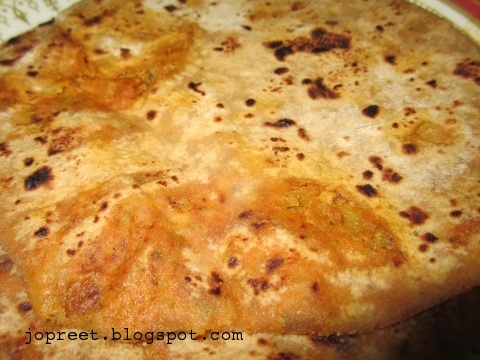 Dust it with wheat flour and roll it to form the shape of a round parantha. Heat a tava and apply ghee/oil. Fry the parantha and once brown spots appear, turn the other side of parantha and apply ghee/oil. Once cooked, remove from the heat and proceed with the remaining. Serve parantha with onion raita. Wat a healthy and yummy paratha,simply love the stuffing. Broccoli in a paratha…that's very innovative.. Looks yum! Love this stuffing. Very different combo.